Are there times when you leave the house and forget to turn off an important appliance? Perhaps you left a light on or the television playing to an empty room—it’s happened to all of us: stray energy waste. Did you know that often times stray energy waste can unintentionally be due to your heating and cooling equipment without you even being aware? Broken or malfunctioning sensors: Sensors help fans or pumps to run when necessary. If an issue occurs where the sensor is not working properly your equipment could be running when not needed wasting energy. Thermostat: Have you ever adjusted your thermostat only to forget to go back and readjust it? If you fail to reset your thermostat you could be losing an incredible amount of energy unintentionally. Within the past few months the Natural Resources Defense Council has published a report titled, Real Time Energy Management, which helps support evidence about the possibility of fairly significant savings when the loss of stray energy is recognized. If you’re in need of your spring/summer HVAC maintenance check, call the experts at Poorman’s Heating and Air Conditioning (260.422.3534). Emergency services are available 24/7. You won’t be disappointed with Poorman’s quick response and affordable, outstanding service. Don’t forget to check out Poorman’s Facebook page! “Like” us! With the spring season come new and exciting changes! We’ve been hard at work providing our Poorman’s patrons with a new mobile website! 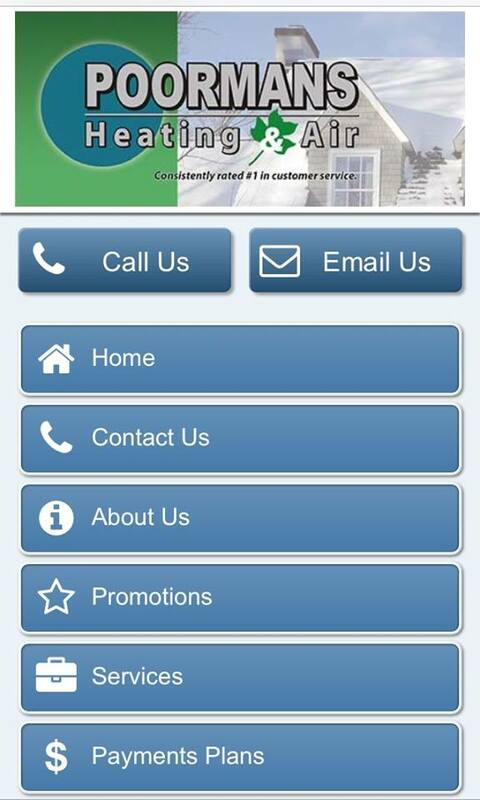 Visit our website on your mobile phone and find an easy to navigate website that’s fully equipped with a direct call button and other easy to use and read features! Let us know what you think about our new mobile site! If you’re in need of your spring/summer maintenance check, call the experts at Poorman’s Heating and Air Conditioning (260.422.3534). Emergency services are available 24/7. You won’t be disappointed with Poorman’s quick response and affordable, outstanding service. Don’t forget to check out Poorman’s Facebook page! “Like” us!